Ditch the fizzy cold drinks and the sugary flavoured bottled water. This summer, lets be healthy with natural fruit-infused H20 you can make at home! These simple-to-make waters are quick, healthy and will satisfy your sweet tooth. Don’t be put off by the subtle flavouring. Because you are using natural ingredients, the taste will depend on the sweetness / potency of the fruit or spice you are using. Add some ice and served chilled. The BeautySouthAfrica team prepared our waters and let them settle for a while to reap the flavours and benefits of the added ingredients. We stored them for easy access in these fancy Brita Fill & Go Filter Bottles. This way our water was clean and pure thanks to the filter inside the bottle lids (which should be replaced every week). They are easy to grip and drink from, and really are of great quality. For all the above, all you need to do is cut your fruit up into whatever shapes and sizes you like, and add it to the water. Leave to infuse for about 30 minutes and then serve chilled or on ice. What flavours have you tried? Share with us below. Good idea, thanks! This is perfect for these hot days! Such a good idea, and perfect for Summer! Looking at the picture automatically makes me want to drink it. I will definitely be trying these out. I have a pitcher in the fridge that I sip from all day. Lemon, Cucumber, ginger, orange and mint. You can mix up just about any flavour combination, and you will want to ditch the soda drinks! Love the combos above. The bottles are too pricy for my liking though. I often add a few mint leaves in my water bottles for a fresh addition. I just love this idea. Makes drinking water much more joyable. Sounds so yummy. I need to try the infused water. I love lemon and mint water and then just plain cucumber water. I have been drinking it for years. I’ve been drinking the strawberry and mint water since reading this, and it makes drinking water SO much easier. Wow this really looks amazing. Who doesn’t want awesome tasting water. Great idea and awesome article, thank you! Mmm, looks delicious! 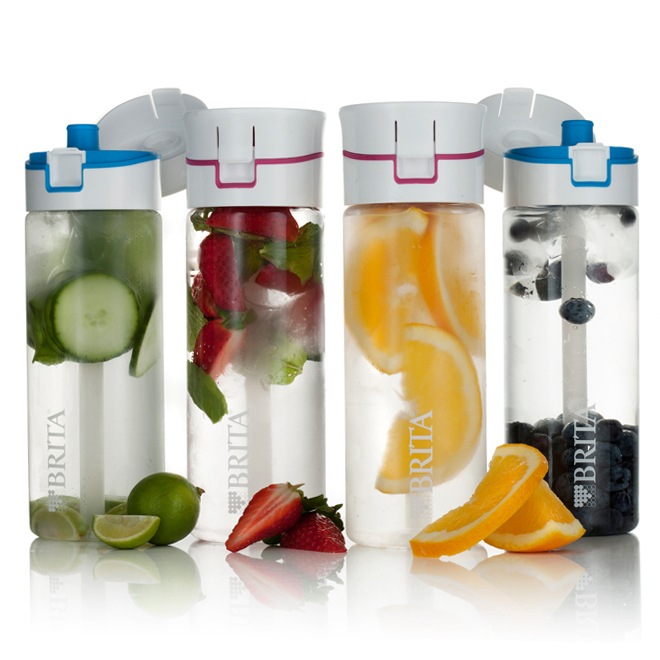 I will be packing my daughter and I one of these refreshing Brita bottles. The orange filled one looks so delish. Try grannysmith apple water infusion, it’s amazing!